too, have apps that exist in the palm of your hand to assist in hay, pasture, and forage management. Here a few that might be useful. HayMap is a free app similar to Craigslist or Facebook MarketPlace where both buyers and sellers can place ads advertising and inquiring about forages around the United States. For buyers, information available on ads can include the species and variety forage and forage quality. From bale size to binding method and fertilizer to irrigation, the producer can quickly advertise all aspects of his production, a buyer may request. For a seller, HayMap allows them to advertise their products before and after baling. 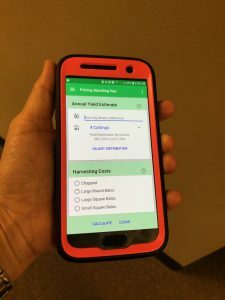 Overall the HayMap app makes locating and selling forages easier than ever for livestock producers. While HayMap is a purchasing and selling outlet, the HayPricing app (available at both the Apple Store and Google Play Store) helps sellers calculate the current price per acre of each cutting while including output costs and losses due to weather and harvest. The goal of this app is to assist hay producers in determining a profitable selling price for their forages. PastureMap is an all-in-one livestock producer management tool that has multiple functions. These functions include tracking paddock rotation, calculating stocking and carrying rates, and evaluating pasture performance. This compact app also helps farm managers keep and share cattle records, forecast animal gains, and combine EID records to the program. PastureMap, currently available for download on cell phones, tablets, and the computer offers a monthly subscription for different three levels of management. While this app costs, it offers a complete package of livestock and grazing management tools. The Information Age is here and managing your forages is easier than ever because…there’s an app for that. Posted in Grazing, Hay, Technology. This entry was tagged grazing, hay, smartphone apps. Bookmark the permalink.